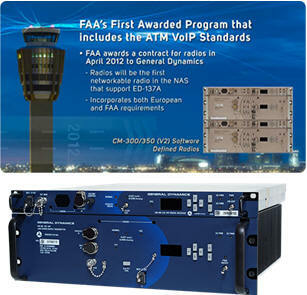 September 4, 2013 - General Dynamics C4 Systems announced that the new software defined CM 300/350 (V2) UHF and VHF air traffic control (ATC) radios have completed the first phase of the Federal Aviation Administration’s (FAA) Factory Acceptance Testing program that evaluated the radios’ hardware and software. These networking radios deliver advanced communications capabilities, including unprecedented sound clarity that makes it easier for air traffic controllers and pilots to hear one another. Combined with other features, the new radios will significantly improve the safety and efficiency of aircraft operating across the increasingly busy U.S. national airspace. “General Dynamics moved from contract award for a brand new radio to delivering radios for acceptance testing in just over a year, which is a testament to the strength of the General Dynamics-FAA team,” said Chris Marzilli, president of General Dynamics C4 Systems. The second phase of testing, scheduled for this fall, will place 90 CM-300/350 (V2) radios in FAA facilities in Florida, Oklahoma and New Jersey to validate how the radios perform in realistic operational environments. The CM-300/350 (V2) radios are a critical component of the FAA’s NextGen modernization initiative. When fully deployed they will deliver a flexible communications network, including Voice over Internet Protocol (VoIP), that will assist air traffic controllers in managing commercial and military aircraft in-flight throughout the national airspace. The VHF radios will link air traffic controllers with pilots in commercial and general aviation aircraft. The UHF radios are dedicated to communication with military aircraft pilots.